Gah! In an eerily predictable move, I have taken much longer than I intended to get around to writing this second chunk of text. Blame Spore, friends, and blame computer crashings that Spore caused. Oh, and blame my complete lack of self-control. Without further ado, I present to you: psychological torture, Legion-style! Okay, I can see how this could be nerve-wracking: grim corridors, a dark room, questions. I can't blame Dirk for his anxiety, really. Turning on some Morgna-style light isn't a bad plan, really. Oops, mirrors! Well, I guess it's time for another plan, right? One that doesn't involve blinding lights? 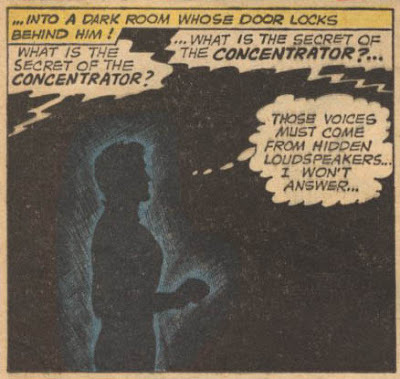 Maybe he could kick out the mirrors in the dark, or light things up just a bit so he can find the speakers, or use his powers in a more focused way and melt through the door? Mirrors wouldn't be much good against those cunning plans, right? Or just bulling ahead in the least strategic way possible, that's a plan. A really, really dumb plan, but still a plan. 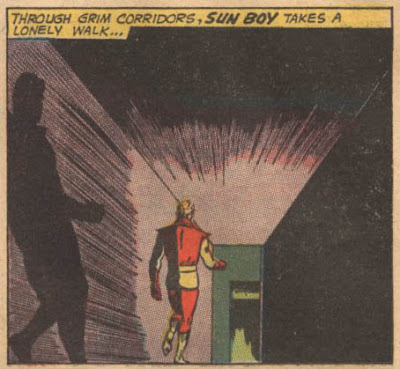 The fact that it actually ended up working is some slight validation, but I think that maybe Sun Boy should be confined for life anyway, for his own safety. I guess he didn't talk, though, so there's no quick answer for you fine folks on just what the gosh-darned Concentrator actually is. 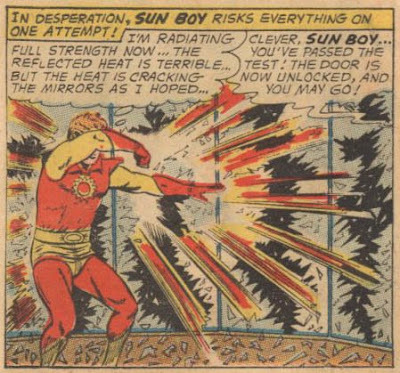 At least you know how to defeat Sun Boy now: get a room full of heat-proof mirrors. Bonus lesson: if you injure yourself through stupidity in the line of duty, try to do it in an out-of-the-way place, so everyone assumes that you were being heroic instead of willfully stupid. 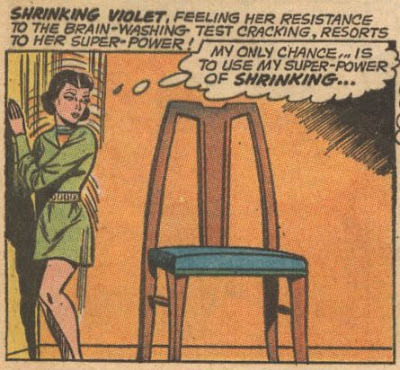 Time for the testing of Shrinking Violet! Now, this was back when our pal Salu was characterized by being very timid and shy and looking concerned all the time (and evidently by wearing a very short skirt, judging by this picture). I... suppose that illusory monsters might be upsetting to such a person, but I have to say that this is pretty weak. That monster? That's not a good monster, folks. I've always liked Shrinking Violet, but her being intimidated by this thing is making me lose some respect for her. Now these are good freaky-looking monsters. 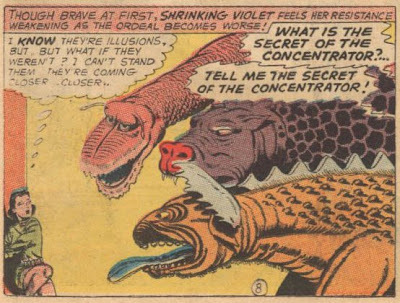 They're only a couple of hours' worth of meticulous line-work away from fitting in in a Basil Wolverton comic - those mucousy lips that the uppermost beast is sporting would be enough to get me talking, if I though they were likely to touch me. 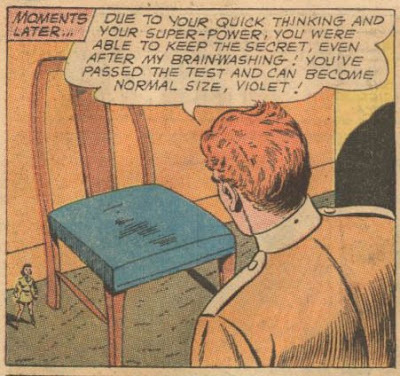 Still, Violet knows these things are illusions - this is fairly wimpy behavior. But I can't stay mad at someone who can make such an awesome horrified face. 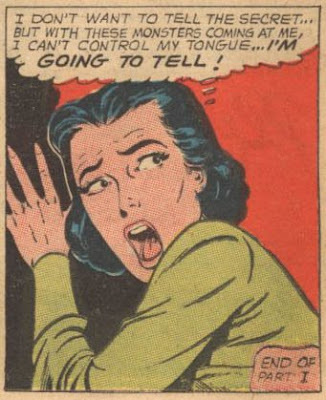 Man, she is so distressed that it's distressing - I believe that I was unable to find out for certain who drew this issue, but whoever it was sure knew how to draw a horrified woman. They were either highly talented at the drawing table or extraordinarily unlucky in the lists of love, I reckon. Still, Violet is smarter than Sun Boy: her solution has to be better, right? "I'll get so small that those monster couldn't find me even if they were real!" Good plan! Wait, no. No, no, no. Bad plan. Dumb plan. Plan that wouldn't even work today, if CSI is to be believed, or if, say, the Commissioner has invested in a volume knob for his recording device. 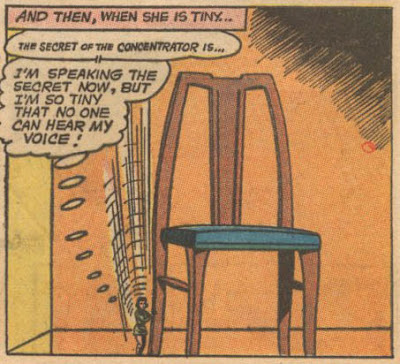 And even if the plan were workable, I'm going to guess that you have to be smaller than 4 or 5 inches before you're completely inaudible. Confined for life! Not confined for life? John... confused. John move on now. 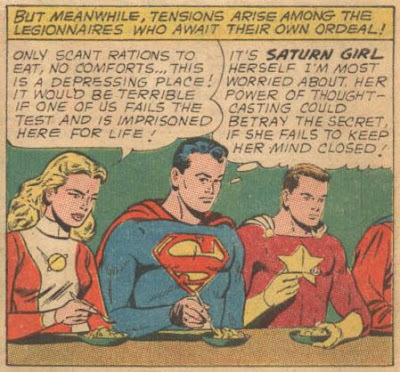 Ah, the Legion. A group of friends who stick together through thick and thin, who are perfectly willing to die so that one of their friends might live, and who are willing to turn on one another at the slightest hint of weakness. 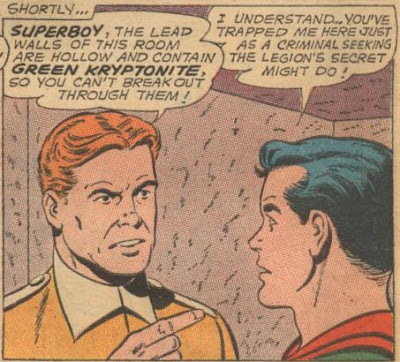 I mean, really, Superboy. "Gawdamn telepaths. Likely to ... think out alla our secrets. I just don't trust a dame to not broadcast her thoughts all over the place. Hey, wait a minute. Star Boy has hands. 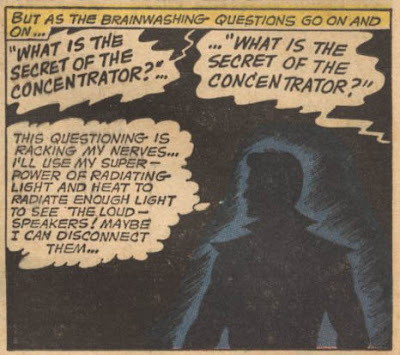 Sweet Christmas, what if he accidentally signs the secrets of the Concentrator, or even doodles 'em out? All would be lost! Guess it's time for some 'accidental' hand-shaking incidents, Clark." "... although you do have that super-shout power, so be careful not to use that to accidentally reveal our precious secrets. And don't write them on the wall with your heat vision. 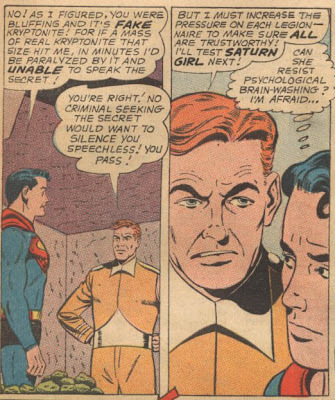 Or use super-hypnosis to implant them in the Commissioner's subconscious mind. Also, try to avoid fusing sand into glass with your hands, because you do that a lot, and it's getting kind of old." Good lord there used to be a lot of kryptonite in the DC Universe. Look at him, he's not even surprised. I wonder if that's what Final Crisis is for - to bring back plentiful kryptonite so that the Superman writers can take it easy for a few years (okay, that was a bit self-indulgent. It's just that though I'm enjoying Final Crisis I can't quite figure out what it's for. The other Crises all fixed something - what's this one doing, other than hopefully ending that particular habit? Ah, ignore me.). Maybe... maybe it's the Commissioner who's an idiot. This is just kind of a stupid tactic, in that you basically get to ask your question once. 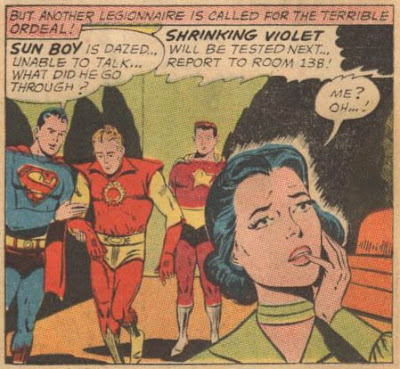 Because that much kryptonite would take Superboy out pretty quickly, right? Oh, I know: Beppo the Super-Monkey would show up at the last second and get rid of the green-k with a giant shovel that he made out of a minivan, but the Commissioner doesn't know about the deus ex machina effects of kryptonite. As far as he's concerned, that lever's a death sentence. For anyone without super-speed. Or seven or eight other lever-stopping abilities. Grump grump nerd nerd. 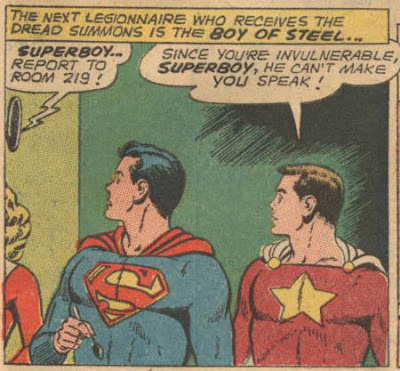 Superboy has absolute faith in his friends! He does not believe that girls can't keep a secret! He has never considered administering a quick heat-vision lobotomy just to be on the safe side! This review is not continued! It won't be continued soon!